Looking back at the photos we posted during our recent visit to one of Asia’s tiniest nations*, you might be forgiven for thinking that Brunei’s only attraction is its imposing mosques. Fact geeks: The Maldives is the smallest country in Asia and Singapore is the smallest in South East Asia. But even though Brunei is eight times bigger than Singapore by area, its population is at least thirteen times smaller. 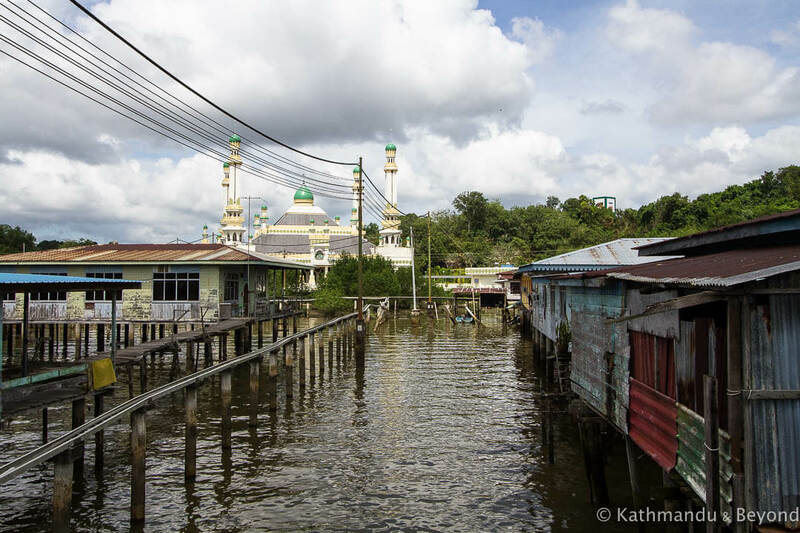 But Brunei is not all mosques and the capital, Bandar Seri Begawan (or BSB for short) has a much bigger pull – its floating water villages. 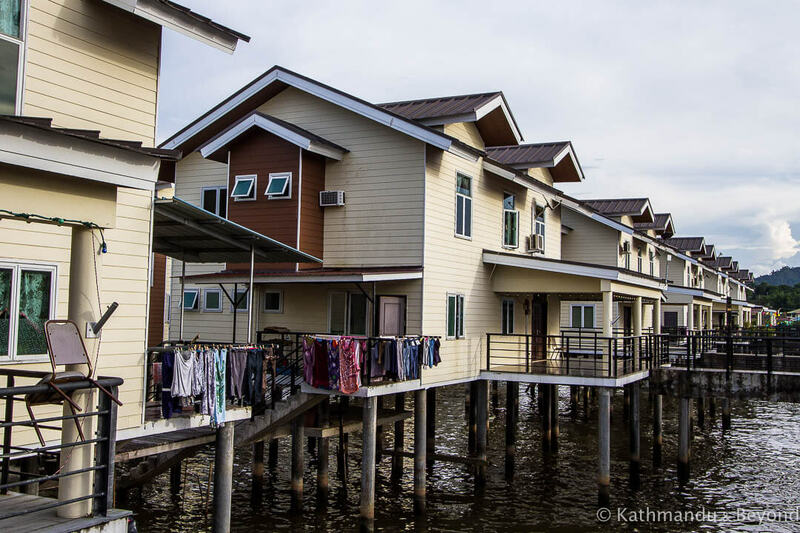 And visiting the stilted houses (which is a more accurate description than floating houses) was one of the things I was most looking forward to, particularly as Kampong Ayer is said to be the largest such settlement in the world. 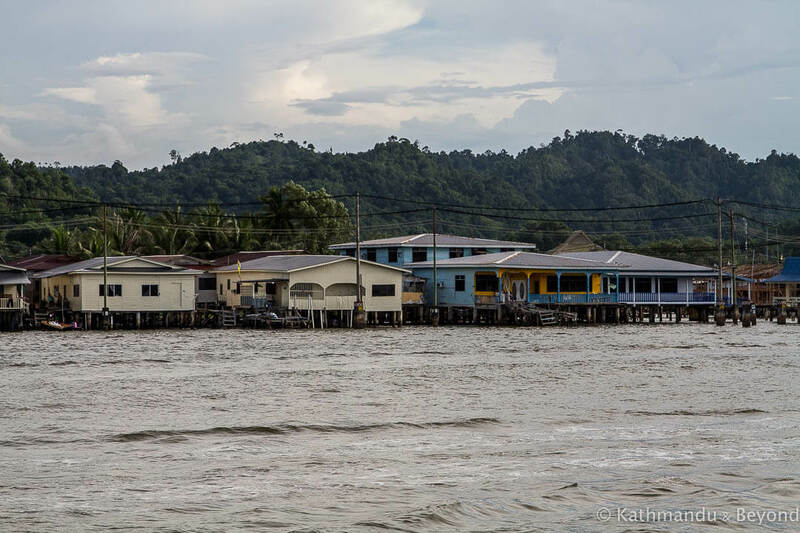 There’s evidence that people have lived in Kampong Ayer for over 1,300 years, but I don’t think anyone claims that it’s the oldest water-based habitation. 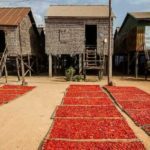 The winner of that title must be older than history itself (to steal a phrase from Mark Twain) – from fishermen, and sea gypsies to Neolithic and Bronze Age dwellers; the history of floating villages and stilted houses goes back a long way. 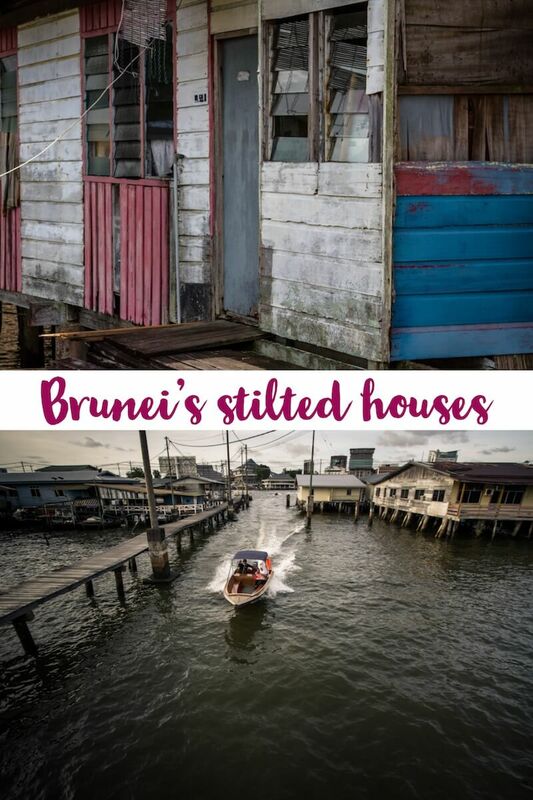 It’s funny to think of one of the richest countries in Asia having its capital on a ramshackle stilted wooden village but up until the early 1900s, that’s exactly where Brunei’s capital was located. 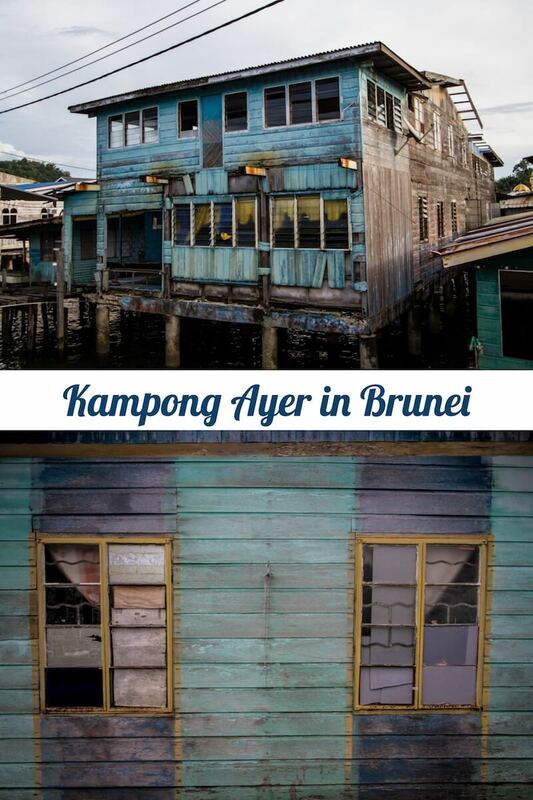 And as little as a hundred years ago, half of Brunei’s population lived in Kampong Ayer. 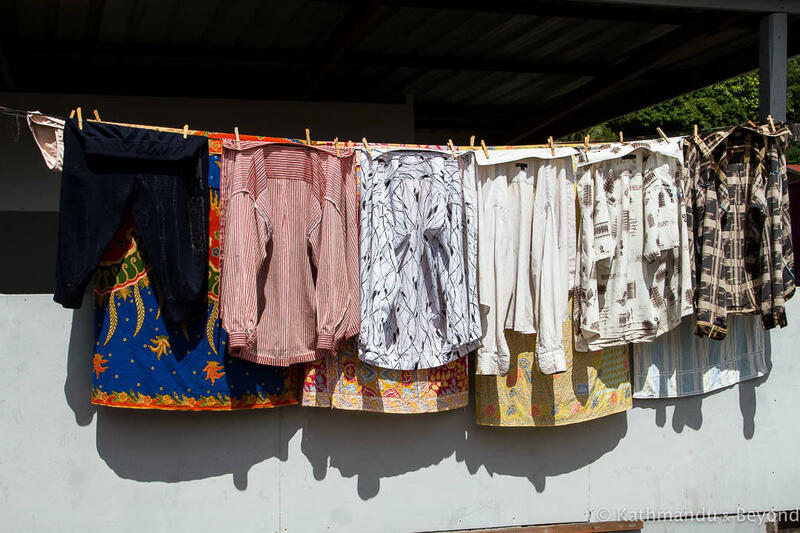 Around that time, the capital shifted to BSB’s mainland but today many Bruneians still prefer the lifestyle of the water village to living on dry land and Kampong Ayer is home to around 30,000 people, which is almost half of the total population of the city. 10th-century Chinese merchants were the first travellers to document their visits to Kampong Ayer but it was in the 16th century that the stilted villages were dubbed the ‘Venice of the East’. I find it more than ironic that it was Venetian explorer Antonio Pigafetta (what a great name!) who gave it this title – it seems a rather curious comparison considering he had the benefit of knowing what the real Venice looks like! Hold on. Venice of the East? Haven’t I heard that somewhere before? If it’s a moniker that seems a bit overused, you may not be surprised to learn that Wikipedia lists over forty places claiming to be the Venice of the East. 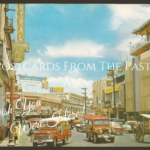 Others we have been to include Dhaka in Bangladesh, Lijiang in China, Udaipur and Srinagar in India, Semarang in Indonesia, Hiroshima in Japan… Malacca, Manila, Bangkok, Hanoi, OK, you get the drift; there are a lot of Little Venices spread around Asia! Back to Kampong Ayer which, by the way, translates literally as water village in the local language (kampong means village and ayer is water). The two parts of Kampong Ayer are separated by the Brunei River, one part forming an island and the other on the mainland. 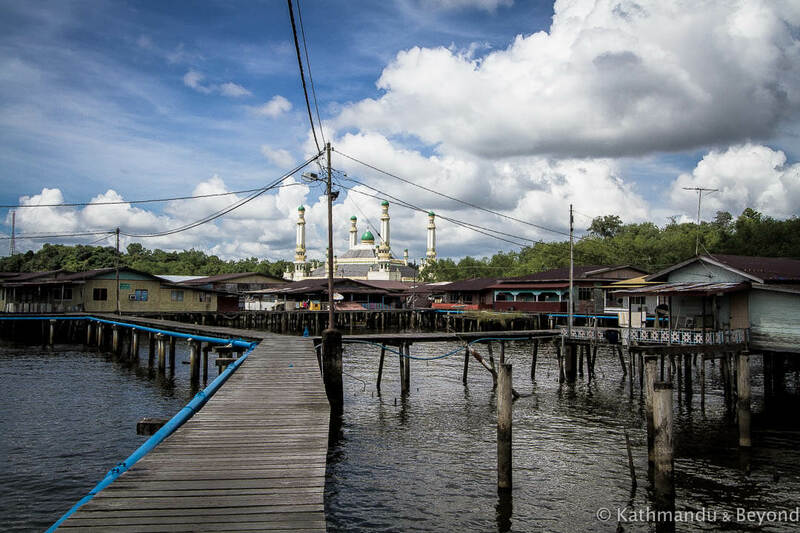 On each side of the river, Kampong Ayer is actually a cluster of over forty kampongs (or villages), interlinked by stilted boardwalks (some 36 kilometres of them!). 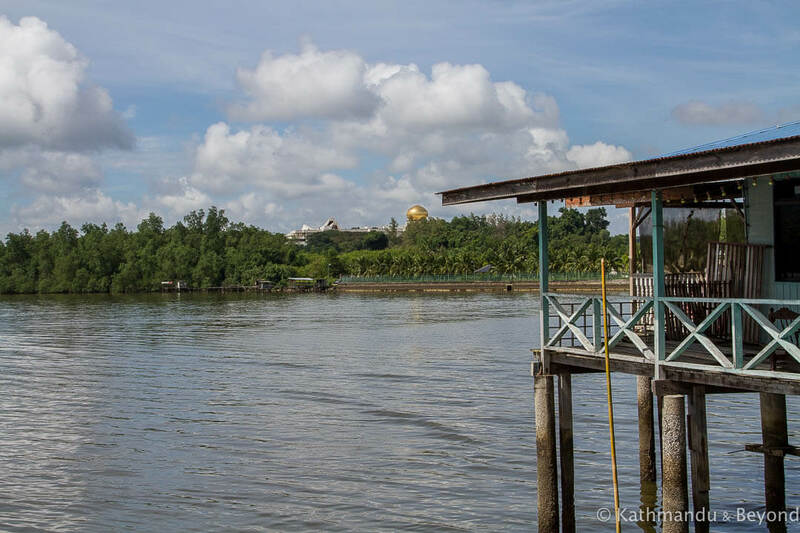 The largest area and the part that most visitors head for, is a short distance across the Brunei river from Bandar Seri Begawan’s downtown waterfront. 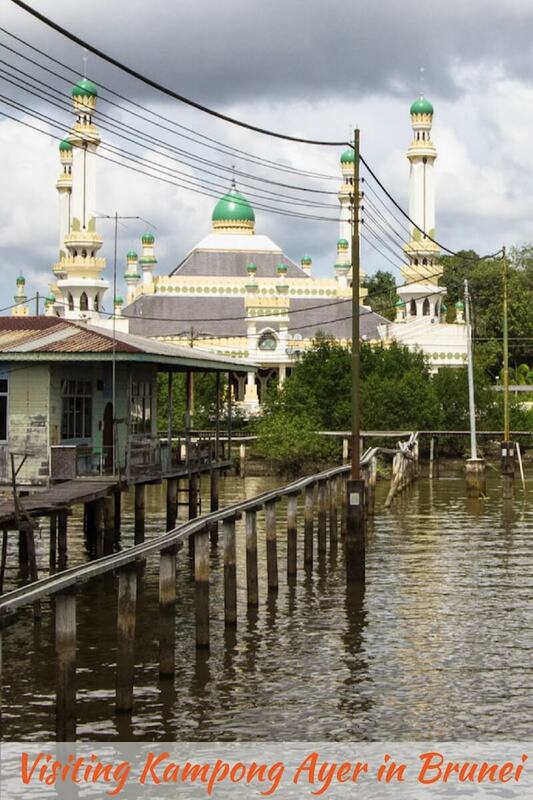 The other part of Kampong Ayer, on the north banks of the city, is reached on foot by walking east of the central Omar Ali Saifuddien Mosque. The geography of Brunei’s capital is probably easier to understand with this Google satellite image map. As it was a short walk from our hotel, LeGallery Suites Hotel, (which incidentally is is good option for budget travellers to Brunei), the first part of Kampong Ayer we visited was the lesser-visited one (not that either get hordes of tourists – we only saw two other western tourists during our three days in Brunei). This part of Kampong Ayer is called Kampong Tamoi Tengah and it’s connected to the mainland by walkways, so there’s no need to catch a boat there. We wandered along the wooden walkways that connect the stilted houses with schools, mosques and boat jetties. The few people we passed were very friendly but generally, the houses felt almost deserted. I suppose on a weekday morning, most inhabitants were either at school or out at work. 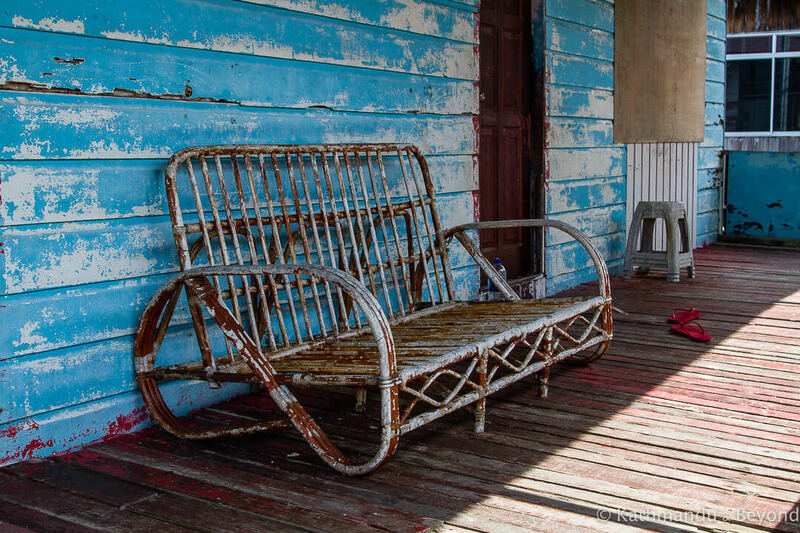 Many of the houses looked weathered, their pastel paintwork showing the effects of the saltwater environment. 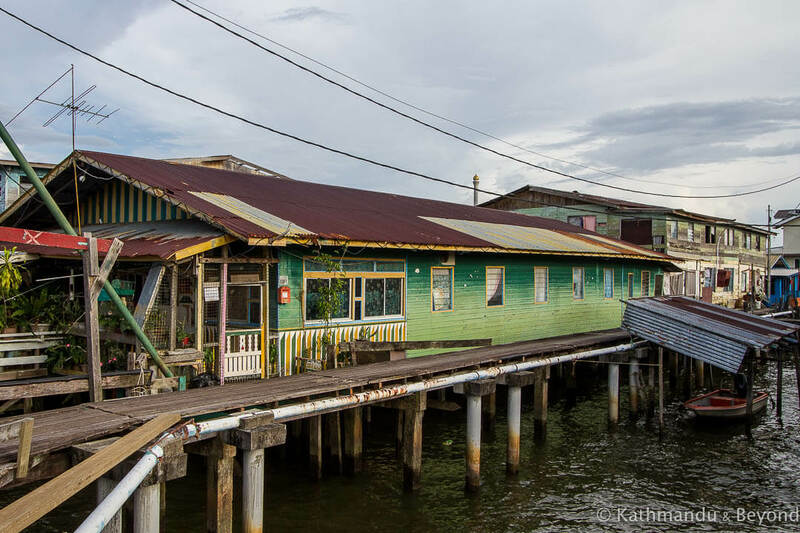 As with all villages in Kampong Ayer, the stilted houses are connected to modern utilities and have running water, electricity, satellite TV and even, in many cases, air-conditioning. Overhead cables bring electricity to homes whilst pipes alongside the stilted walkways carry fresh water. On the whole, the villages seemed well-kept although the further we wandered from the centre, the more rubbish we saw floating in the river and the more run-down the houses appeared. At least they have a modern sewage disposal system to whisk away those types of nasty things. 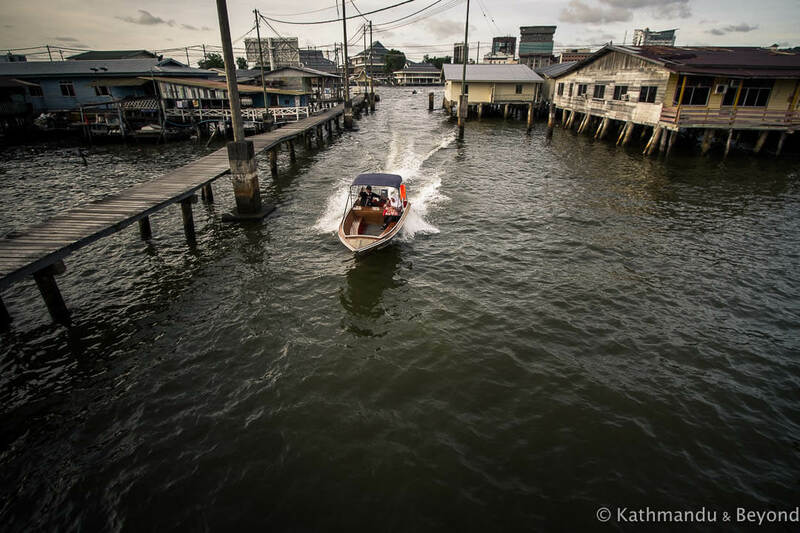 The next day, we crossed the Brunei River by boat to the heart of Kampong Ayer. We were dropped at the entrance to the Kampong Ayer Cultural and Tourism Gallery which opened in 2009. This small museum is free and provides some useful information about Kampong Ayer’s history, from ancient times to modern day. There is also a viewing tower from where you have a panoramic view of Kampong Ayer. The Visitor Centre is open daily from 9.00am to 5.00pm except on Friday when it closes between 11.30am and 2.30pm. It is also closed on public holidays. To make the water village a unique tourist destination. After spending some time in the Visitor Centre, we set about exploring Kampong Ayer. I’d expected a somewhat commercialised aspect to this part of Kampong Ayer, but I was wrong: there were no souvenir shops or cafes vying for our dollar, nor were there any kids with outstretched hands. 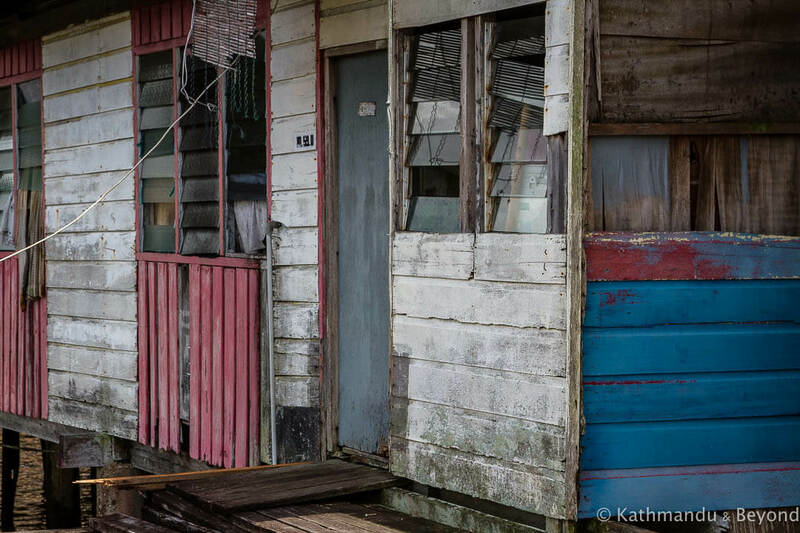 Despite the rundown look of some of the homes, Brunei is still a wealthy country and its citizens are well looked after. Kampong Ayer has its own schools, mosques and hospitals, police and fire stations. The only thing we didn’t see a lot of was shops. There were a couple of small convenience shops on what looked like peoples’ porches, but certainly nowhere to do a ‘big shop’. Many residents have cars parked just across the water on the mainland waiting to assist with that task though. From the viewing tower, I was surprised to see several rows of extremely modern, two-story prefab homes. 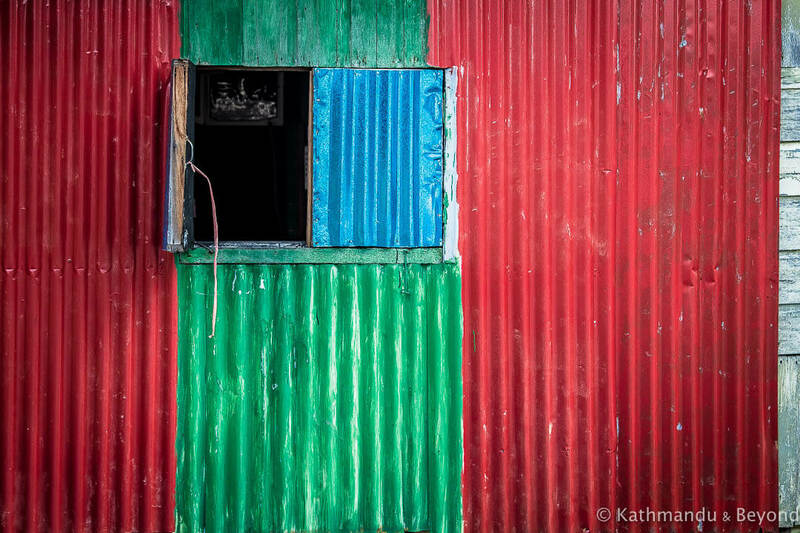 They were a far cry from the rickety-looking wooden structures with flaking paint we had seen earlier, and at first, they looked out of place. But every town has its more salubrious parts and this was clearly the posh end of town, I reasoned. Continuing along walkways, past the swanky estate, we wandered in a similar fashion to the previous day and saw much of the same thing. 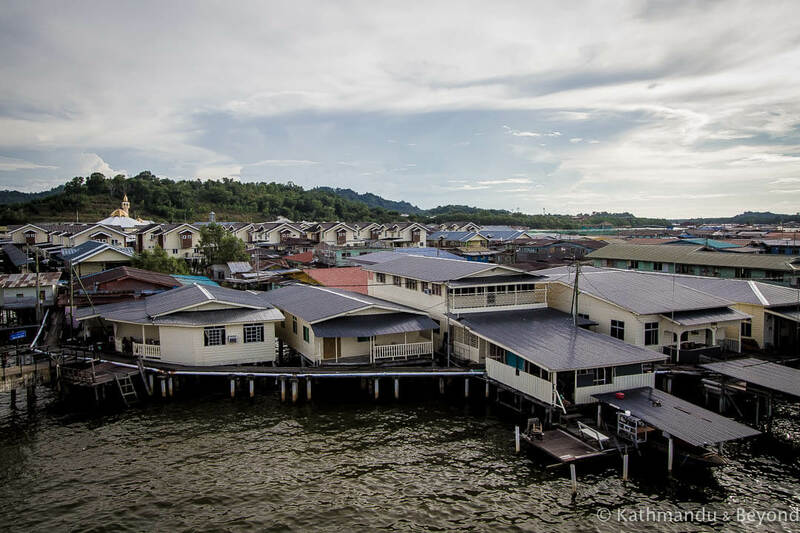 Whilst it’s always interesting to see how people in other countries and cultures live, there just didn’t seem to be much going on and Kampong Ayer felt slightly abandoned. I know that is usually a bonus for us, but in this instance we were hoping to encounter some local life. Just to see a few folks would have been nice. At the same time, I do appreciate that the way people live their lives is just that, and they are not just sitting around waiting for camera-toting, self-indulgent tourists. Maybe if we’d visited very early or the morning or in the evening we’d have had a different experience but we had very little interaction with people there. After an hour or so of idle wandering, we headed back to the mainland by super-speedy water taxi. Although it was a short trip, it was a slightly nerve-wracking ride for someone who doesn’t like being on the water. The small wooden boats, sit low in the water and zip across the river at quite a speed, darting between and around each other. Getting on and off the boats is also a bit of a test for a balance-challenged person such as myself. The boats bob around quite a lot and you need to step agilely from steep, slippery steps to the boat and then off again onto a rickety wooden staircase, neither of which is equipped with any form of handrail. Mark always looks a bit nervous whenever we’re required to jump on and off moving boats – despite him lending me a helping hand, he is convinced I am going to fall in the water! Jokes aside, those with mobility difficulties should consider this and may decide it more prudent to stick with visiting the part of Kampong Ayer that is accessible on foot. A ‘how to’ guide is not really necessary when it comes to visiting the floating villages because they are so much more accessible from BSB than I had imagined. For some reason I’d envisaged the need for public transport to the middle of nowhere followed by a lengthy ride by boat (I hadn’t read that section of the guidebook at this point!). In fact, it takes a mere few minutes to reach Kampong Ayer from BSB’s downtown waterfront. All you need to do is head to the banked steps leading down to the river (be careful as the steps can be slippery) and hail one of the numerous water taxis that are perpetually crisscrossing the water. Easier still, you don’t even need to hail one – as soon as the boatmen spot you, several will speed in your direction. 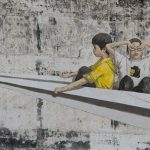 Unlike many places in South East Asia, no lengthy negotiations over cost are necessary – it’s a fixed cost of one Brunei dollar each to cross the river. If you want to go further, i.e. from the northern bank water villages to the southern ones, that’ll probably cost you two Brunei dollars per person. There are approximately 55 pence or 75 US cents to the Brunei dollar, so neither fares will break the bank. If you want to visit both parts of Kampong Ayer, you can get a water taxi to take you directly between the two. It’s a little bit farther (although not much) and the fare is two Brunei dollars. To walk from central BSB to Tamoi Tengah stilted village, take the new pedestrian bridge (Sungai Kebun Bridge) which is in the Sungai Kedayan Eco-Corridor park, next to the Omar Ali Saifuddien Mosque. In fact, the bridge is so new, it wasn’t officially open during our visit but it should be by the time you read this. Amazing photos. Thanks for writing about your experience in Brunei. You’re welcome. Glad you enjoyed the post. Thank you so much for taking the time to tell me about this, much appreciated. Oops on my part, and I’ve now updated it with the correct link!